The new Cardinals manager is optimistic about his team early in 2019, despite a three-year playoff drought. JUPITER, Fla. — Cardinals Spring Training 2019 consists of 41 days of camp. The first day a ball was thrown was Wednesday morning. 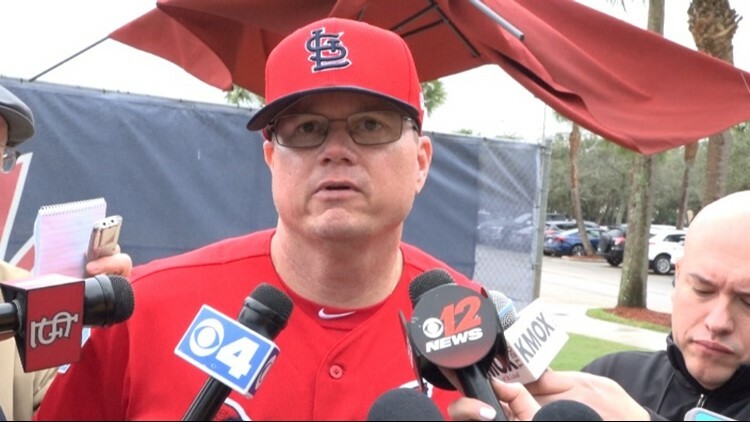 It was also the first day Cardinals manager Mike Shildt officially addressed his team in a Spring Training uniform. "It was a 'welcome.' Good to see everybody again. Excited to get goin'," greeting Shildt gave to the media on Wednesday morning. Whether it be a greeting or a form of instruction, Shildt is big on communication. Therefore, he also quickly noted Wednesday how he will set early expectations for his team. "Daily excellence," Shildt said. "We talk about normalized excellence, It's great about talking about it. It's more about doing it." It was great to see Shildt "doing it" and acting the part. Starting his first full year at the helm, Shildt had genuine poise. As a media member, I too appreciated his communication skills. When I asked about his managerial style, including his communication and how he plans to get the Cardinals back into the playoffs, Shildt kept using these three words. "[I'm] confident. You know it's a good feeling to know that you've got a group that's synced up to a point that they are now and they are still looking and encouraging and wanting to be synced up," Shildt said. "We still have more syncing to do," he said. "We've talked about it. Now the execution comes into place. But there's no real surprises. People have been communicated with." "This is our Spring Training," Shildt said. It's not our staffs' or mine, it's ours," he said. "It's the groups' Spring Training. What that means is we're doing it together. It's interactive." Shildt added that while he's taken plenty of pages out of the Tony La Russa and George Kissell books of managing, he's certainly adjusting his style to fit his team's needs in 2019. "This camp will have its own identity. I'm not worried about it being done different. I'm worried about it being done well," Shildt said. "The end result and the expectation of the camp is that we will leave here with no stone unturned."